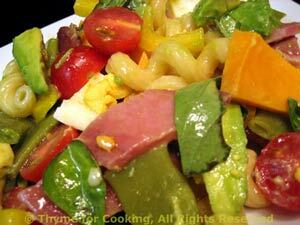 Thyme for Cooking Dinner tonight: Cobb Pasta Salad. This is not a traditional pasta salad. With lots of vegetables and big chunks of ham, cheese and egg, no one will mistake this for a small side dish. I didn't thoroughly cool the beans. As I wanted them to retain a bit of warmth I just rinsed lightly. Top and tail beans... cut off the ends. Cut into 1 1/2 inch lengths (4cm). Add beans and blanch for 4 minutes. Remove, drain, rinse with cold water and set aside. Slice pepper, about 1/4" thick (.5cm) then cut slices in half. Slice ham or turkey and cheese into large, bite-size chunks. Cut avocado into large chunks. When eggs are done, cool, peel and cut into chunks. Tear large basil leaves in half. To assemble: Put drained pasta in a large bowl and add vinaigrette. Toss well to combine. Add ham, peppers, tomato and beans, toss well. Add cheese, egg, basil and avocado. Stir gently, just to combine.